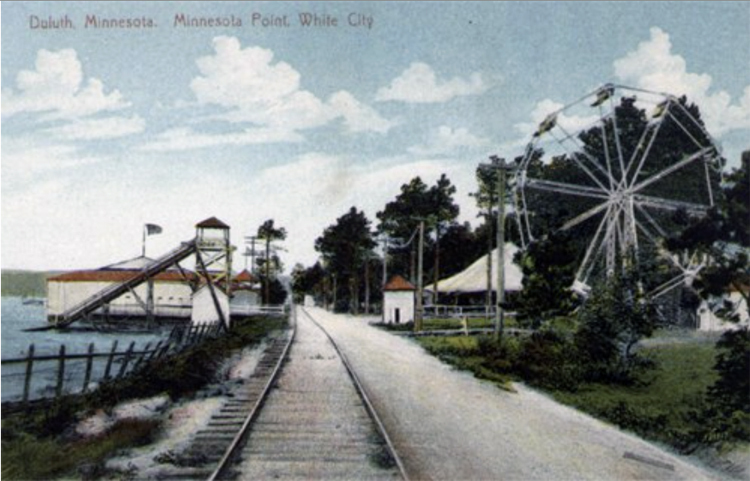 In 1906, attempting to take advantage of the popularity of Minnesota Point, members of Duluth’s Retail Merchant’s Association, Real Estate Exchange, and the Duluth Commercial Club established the Duluth Amusement Company with the goal of building an amusement park in Duluth that would be modeled after Chicago’s White City Amusement Park, built in 1905. The Chicago amusement park’s name came from its numerous buildings outlined with white lights. The name also recalled Chicago’s 1893 World’s Columbian Exposition, which took place near the same location. The Duluth company included park board vice president Bernard Silberstein and eighteen-year-old O. C. Hartman, a principal of the Interstate Traction Company, which owned the streetcar line on Minnesota Point. His father, Charles Hartman, owned the Oatka Beach Addition at the end of the streetcar line where the Oatka Pavilion stood. They planned to build Duluth’s White City on Hartman’s land; the old pavilion would be retained and, like everything else, it would be painted white. Designed by St. Paul contractor Thomas H. Ivey, White City opened June 30, 1906. Festivities featured a speech by Duluth mayor Marcus Cullum and music by the Third Regiment Band. The three thousand people who filled the park had their choice of rides such as the Mystic River boat trip, a merry-go-round, a toboggan water slide, and a miniature railroad made by the actual Duluth, South Shore & Atlantic Railway. Visitors also enjoyed acrobatic and vaudeville acts and circus tent performers such as Olga, “the lady who ties herself into all kinds of shapes.” In the evening, LaBrosse’s Orchestra played dance music in the pavilion while the park glowed with the light of hundreds of electric globes arranged in beautiful designs. No alcohol was served; White City was dry. Adults paid ten cents and each child was charged a nickel. More attractions were added later, including a Ferris wheel, the Old Mill, an undescribed ride called “Bump the Bumps,” and the Fun Factory, where ticket payers lost themselves wandering on twisted paths and “[ran] up against all kinds of funny and startling adventures.” Other attractions included a corral of deer, a Gypsy Village, an automated baseball game, and a roller skating rink. White City was outfitted with sitting rooms (for the ladies), cafés and restaurants, and bathhouses. Plans for the future involved more attractions, including a roller coaster and a $7,500 gasoline-propelled airship to be named Duluth No. 1. Neither was built. 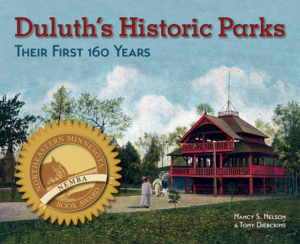 Despite reports in the Duluth News Tribune that the summer of 1907 found “the White City at the height of patronage and popularity,” and “each and every attraction in the park is meeting with merited success,” it survived for only two seasons. In May 1908 the Duluth Amusement Company revealed that it was unable to pay debts of over $19,000. Thomas Getz took control of the operation and renamed it Joyland on the Point, but the change didn’t help. The park opened for the last time in July 1908. By the spring of 1909, the amusement park closed for good and its buildings were dismantled and taken away. The grounds, officially named Hartman Park, became popularly known simply as Oatka Park. It once again became a spot for picnics, and the streetcar company continued to sponsor free band concerts. Abe “Candy” Busha ran the pavilion until a suspected arson fire destroyed it in June 1909. That year the Duluth Boat Club relocated one of its facilities to the pavilion site. A portion of White City’s band shell was later incorporated into a house, which still stands at 4010 Minnesota Avenue. As of 2016, most of the White City site is occupied by the Duluth Rowing Club and the Franciscan Health Center.